Having now been playing golf for over 37 years, I have had some great rounds of golf. But last week, I can honestly say, I may have had my most enjoyable 9 holes in my history of playing the game. Ironically, I was not the one hitting the ball, but being the caddy for my 7 year old Ally. 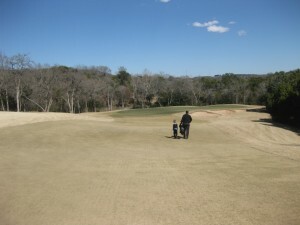 Last week, at the US Kids golf tournament, Ally and I journeyed out to the Onion Creek Country Club. Coincidentally, this is the course that I played my first tournament at 5 and made my first hole in one at 8. Needless to say, it brought back some wonderful junior golf memories. On the 4th hole, as Ally and I were holding hands walking down the fairway, I recall saying to myself “this is as good as it gets.” This special “father-daughter” bonding experience happened the entire day… we talked, we laughed, we gave big hugs, high 5’s and even strategized about some golf shots. Needless to say, it was one of those days you want to bottle up. My reasoning for sharing this with you… is simply to point out the power of the game we call golf… and encourage parents to not miss the boat by getting to wrapped up on birdies, scores or trophy’s. (more on this in a later blog). So my encouragement to all parents – take advantage of the gifts of the game! The game of golf is a gift. What other game can a 7 year old play with an 87 year old? Where can a parent and their child spend 5 hours talking chasing a little ball around? What other game can you teach core values about life? The opportunity that golf can give to parents is amazing if you take advantage of the game…. don’t have any regrets and focus on the right priorities!